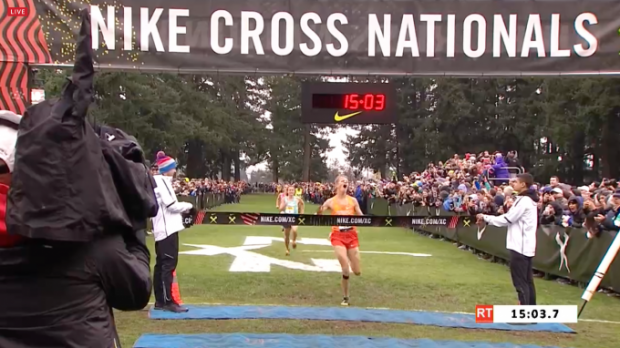 The boys Nike Cross Nationals individual title will stay in Utah for the third consecutive year as unheralded Aidan Troutner of Timpview High took the upset win over top-ranked Brodey Hasty of Tennessee, 15:03.9 to 15:05.9. Troutner, a BYU commit, ran in fourth place for most of the race behind James Mwuara, Hasty, and Danny Kilrea. Mwuara, the Washington state champion, led the group through two miles in about 9:48 and looked the smoothest in the latter stages of the race. As the top four crested the final hill, Hasty -- third last year at Glendoveer Golf Course as a junior -- finally made his move but couldn't shake Troutner, who overtook the favorite in the final meters for his first national title. Liam Anderson of California made a late surge to overtake Mwuara for third, 15:07.6 to 15:12.6; Kilrea placed fifth in 15:14.5. The win caps a tremendous season for the Utah state champion. This race marked his first appearance at a national cross country meet; last year, he was 14th at Foot Locker West and ninth at NXN Southwest to just miss qualifying. Troutner continues the Utah tradition at NXN established by American Fork alum Casey Clinger, who won the past two editions of the national championship. He was the top freshman at NCAAs this month, placing 24th overall to lead the BYU Cougars to a third-place podium finish. In the team race, Loudoun Valley/Purcellville won their first Nike Cross Nationals title in their first appearance at the championship. Their scorers included Peter Morris in 12th, Sam Affolder in 23rd, Colton Bogucki in 37th, Jacob Hunter (Drew Hunter's younger brother) in 43rd, and Connor Wells-Weiner in 95th. Their sixth man, Chase Dawson, placed 108th and would have been enough for the squad to win the team title even without Affolder, a Foot Locker finalist as a sophomore who transferred this year from Carlisle High in Pennsylvania. The Fayetteville-Manlius boys took second place with 159 points to reach the podium for the first time since winning in 2014.